The days of passive TV are over for both viewers and broadcasters. Consumers are cutting the cord and watching what they want, when they want, wherever they are in the world – online. The broadcaster of tomorrow is actively leveraging over-the-top (OTT) services to gather insights into individual viewer consumption habits. This knowledge helps broadcasters build 1 to 1 relationships with viewers and maximize streaming revenue. 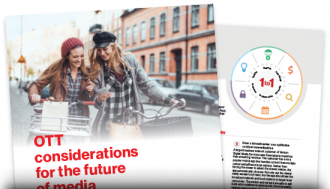 In our white paper, “OTT considerations for the future of media”, you’ll learn about the technology solutions that streamline the OTT content creation and repurposing workflow and get a look at how AI-based technologies can improve compliance, monetization and viewer experience. Download the white paper now to learn how our Uplynk Video Streaming service and Volicon Media Intelligence service can help you.